Seemingly "Old School", this .357 Magnum cartridge was way ahead of its time, thanks to the devastating inherent ballistics for the cartridge. The Semi jacketed hollow point projectile design as classic as it is; is still exceptionally potent on target. A lot of the engineering we had in the 1960’s and 1970’s shaped the engineering feats in ammo in the recent decades. 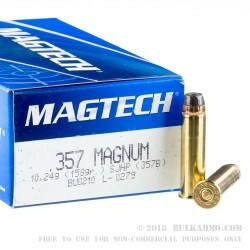 The .357 Magnum by MagTech in a SJHP (Semi Jacketed Hollow Point) configuration is a very solid one load choice for those who prefer to carry what they shoot at the range. And while you won’t have exactly the same deformation reliability and the uniform expansion of a more engineered projectile, you will have excellent ballistics and time tested; proven one shot stop potential. 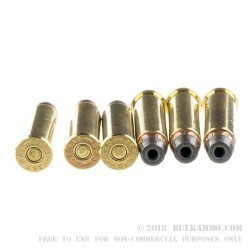 This is a relatively hot load with above average recoil, and a strong contender as a range round as well as a more than adequate .357 magnum carry load. 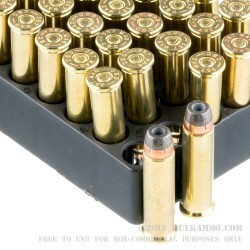 It will shoot out of any .357 magnum firearm reliably. 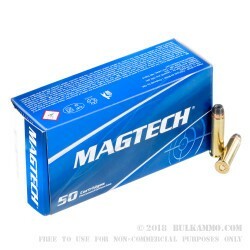 I bought two boxes of these to try them out: they are a great shooting round, at a reasonable price. No flyers in the boxes, and they held on target well. Bulk Ammo got them to me very fast. Q: Hi, The highest grain I have shot my 357 - 7 shot revolver is 125 and that was pretty powerful. Like a hand cannon. Would 158 grain be too much for a short revolver? Thanks for the anticipated reply. I'm a previous customer. A: You might find that the 158 grain loads actually have a little less recoil than the tooth-rattling 125 grain loads, which are driven at extreme velocities.